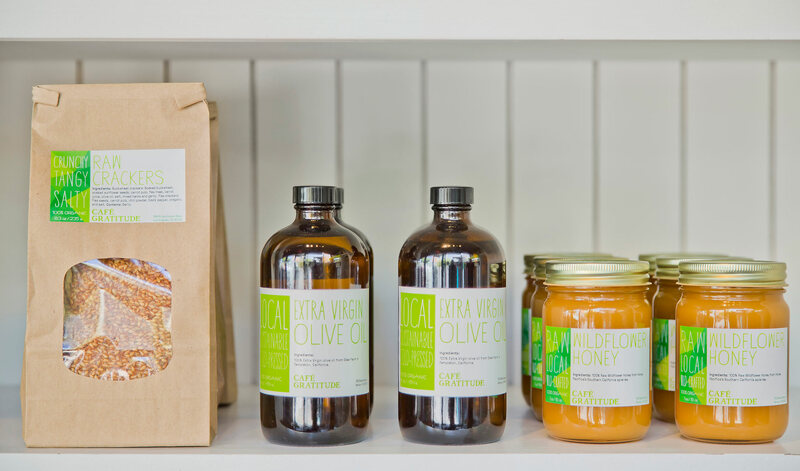 This organic vegan restaurant has always been a family affair. 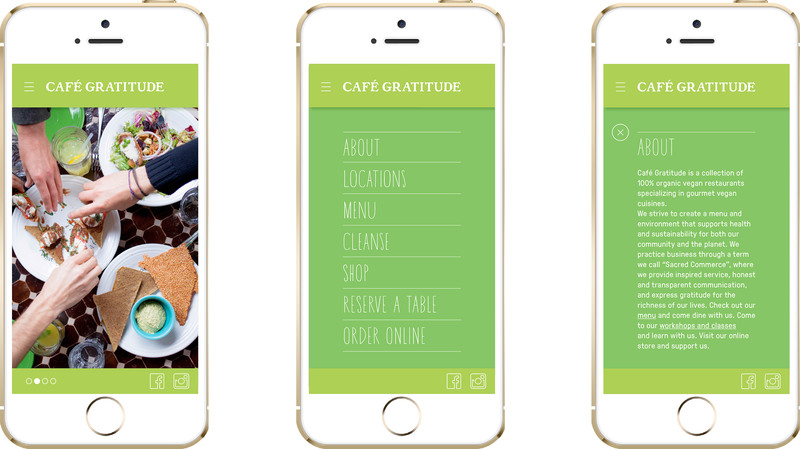 But when the business expanded from two locations in San Francisco to a family of restaurants across California (and Kansas City), it needed to unify its image with a sophisticated, recognizable brand. 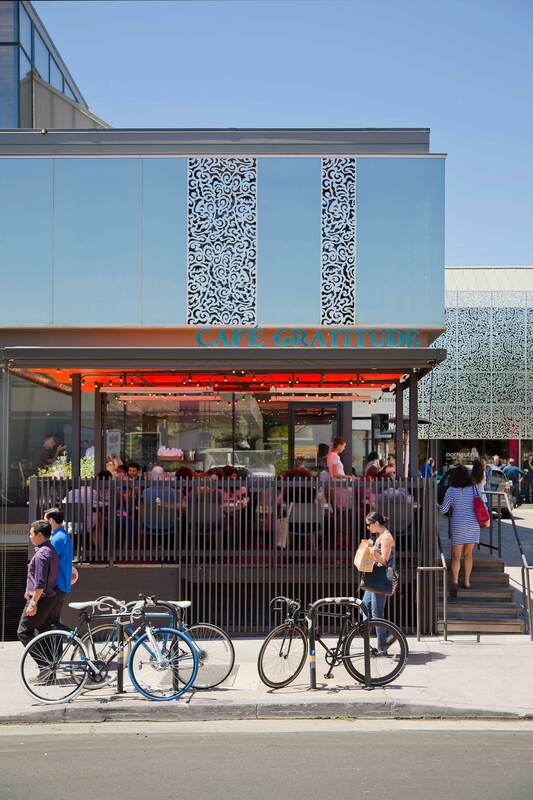 Café Gratitude’s brand promise was already strong: to offer delicious, nourishing food that expresses a world of plenty and honors the earth and the local farmers who sustainably till it. 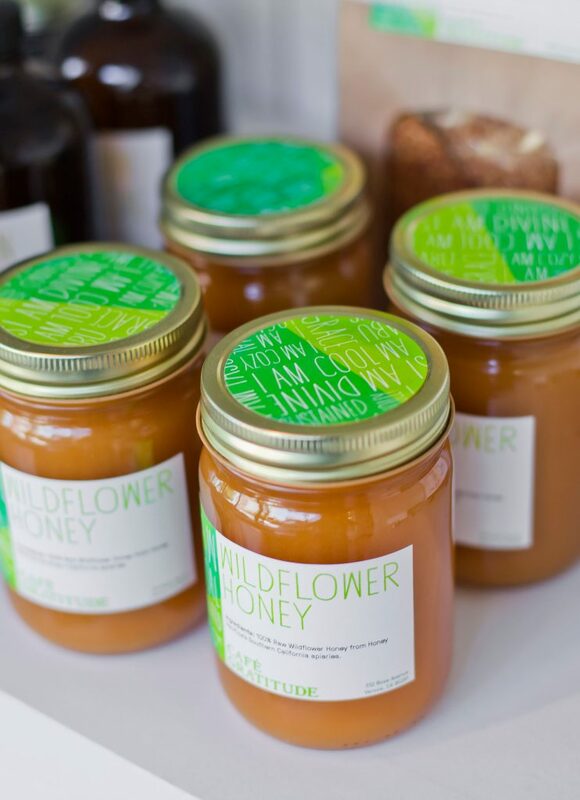 We refined the message to celebrate the company’s dedication to freshly prepared organic food, while retaining the emphasis on family ownership and community connection. The result is a string of destination restaurants, each of which feels thoroughly grounded in its own local neighborhood. 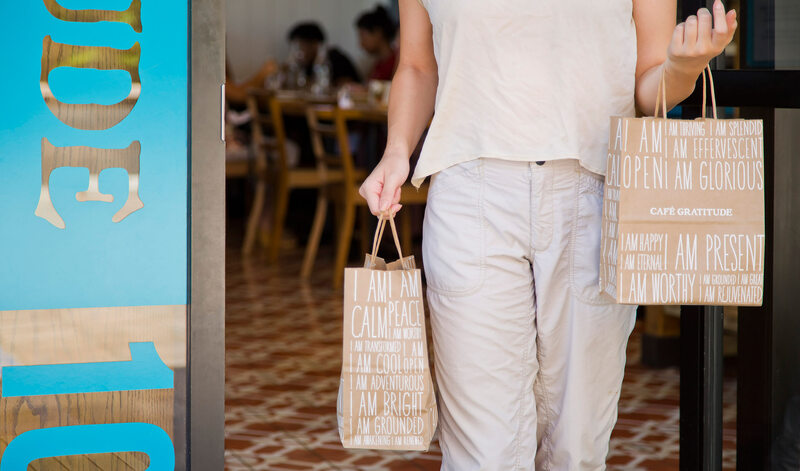 Our branding concept unified the experience at all the restaurants, while maintaining each one’s personality so it never feels like part of a chain. We simplified the multitude of graphics systems with a single logo that allowed each restaurant to add its own location. We chose a friendly and informal font for the logo that retains a handmade quality, and added a secondary sans serif font that improved legibility. 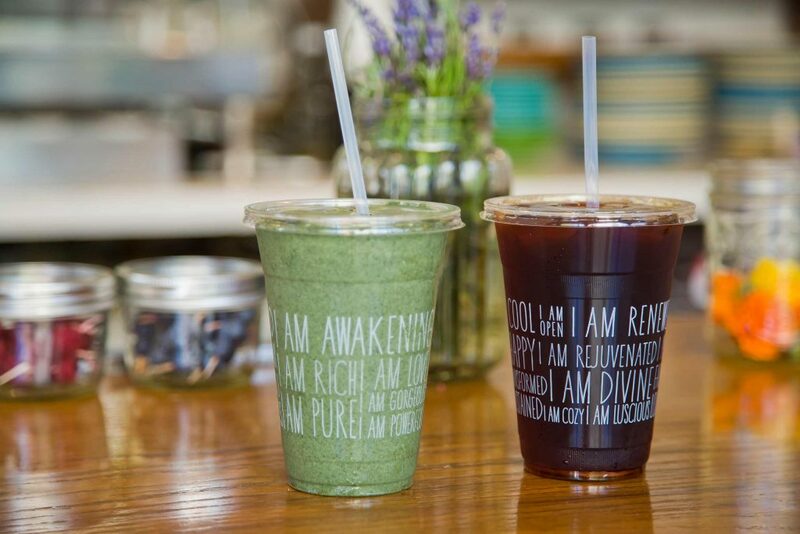 We kept green as the brand color for obvious reasons, then chose a shade that evoked wheatgrass, the quintessential Café Gratitude offering. Finally, we established brand identity guidelines so the company would have room to grow in a consistent way after our work was done. 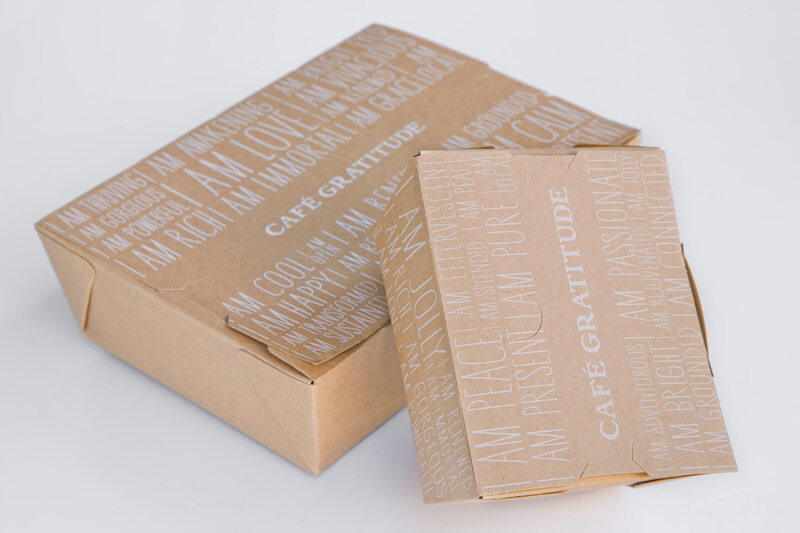 Our branding appears on all of Café Gratitude’s menus, gift cards, aprons, paper bags, and packaging.